I'm always trying to find new and exciting things to grow. Over the years I've discovered some that we really like growing and eating. We grow Cucamelons every year now, along with Peruvian Black Mint, Quillquina, Electric Daisies, wine berries and more. New fruit, I think, is something to get excited about. Maybe it's just my sweet tooth but I love to try out anything like that. I remember going to Asia for the first time and being blown away by the choice of tropical fruit, but I love our temperate fruit even more. 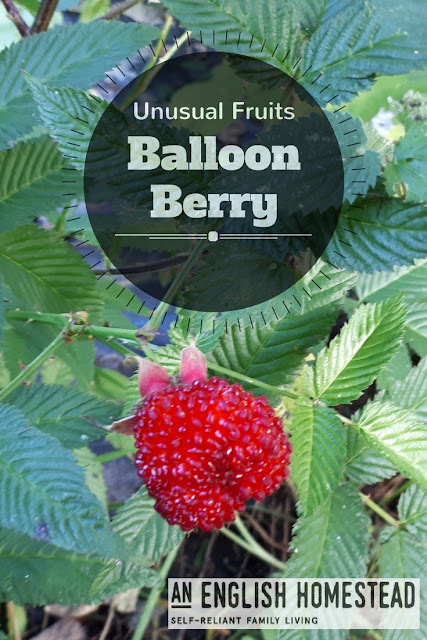 When I stumbled upon a fruit I hadn't heard of, a balloon berry, I just had to buy some and plant them. 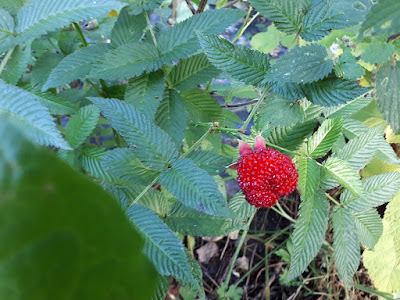 Latin name Rubus illecebrosus if you want to goggle it. When they came they were far smaller than advertised and smashed to pieces, I got some money back and set about trying to keep them alive. 18 months later I've had my first fruits from them. 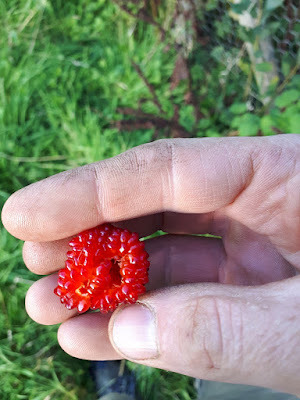 They're bigger than a raspberry, growing on a tall strawberry like plant. They look beautiful, like three raspberries fused together, but all the little bubbles are somehow finer. And how do they taste I hear you ask? INSIPID I think would be the best word to describe it. They tasted of very little, even the long wait and anticipation couldn't improve the taste. Don't get me wrong, they didn't taste bad, they just didn't taste of anything really, just sweetness and a little sour. I'll keep these two plants growing as a bit of an oddity in my garden, who knows when they crop heavy they might make a great preserve. But if I was short on space I'd rip them out and plant some more Japanese wine berries instead. I might even move them out to the coppice and add them to the forest garden area as they will tolerate shade. Maybe with some plant breeding these berries could be the next big thing, but they need some work before then! Have you heard of or grown these berries before? What unusual fruit, veg or herb do you think i should try to grow next? If I've heard of this before I've forgotten, so I googled it and the first article I found was this http://www.telegraph.co.uk/gardening/plants/fruit/8647882/Resist-the-urge-to-branch-out-with-fruit.html which agrees with you! It suggests cooking may help? It also says that they've used it to improve modern raspberry varieties so maybe we've had the best of it already. I'd read that but I thought I'd still try it. I think it grows well in shade so it can grow in my coppice area next year, if I don't harvest it then no loose, but if I do and have enough to make a preserve then its a bonus. The wine berries are great though aren't they, I'm going to grow loads next year! If you lived here, you'd probably being growing pot. Even the old ladies here have a little kitchen garden for weed. Ever so often, the "pot chopper" comes and hovers over my place out in the deep forest, because I hacked a meadow out of the woods. They are sure that it has to be a pot farm. Bit of a leap from growing berries to growing pot! I'd fear life int he can far too much to do that! They are both beans , they are Gigantica a type of runner Bean from Greece They have huge seeds, great for dryingfor winter. The other is a french bean called Lazy housewife, they never get stringy, when they get a bit old ,they just start to dry out and the seed is round and fat, good flavour and can be dried and stored. I've never heard of this. You sure find some unusual things. How do you hear about them? Any books to recommend?